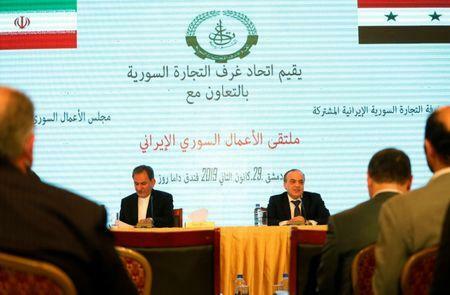 DAMASCUS (Reuters) - The governments of Syria and Iran have agreed steps that will allow bank transactions between the countries, officials said on Tuesday, a move aimed at boosting trade and investment as Damascus looks to its ally Tehran to help rebuild from war. Shunned by Western states that backed the opposition, Damascus is looking to countries such as Iran, Russia and China to help rebuild. But banking transactions between Syria and Iran have been affected by Western restrictions on their access to the international financial system. 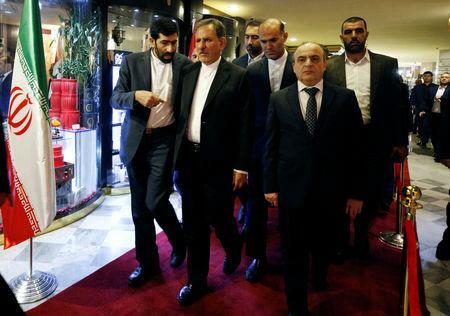 Addressing an Iranian-Syrian business forum in Damascus, Jahangiri said "ministers confirmed that banking transactions will take place very soon between the countries". In comments circulated by Iranian state media, Abdolnaser Hemmati, Iran's central bank governor, said the agreement enabled banks to conduct transactions in their local currencies and non-dollar foreign currencies. Iran has supported Damascus in the war through the deployment of its own forces in addition to Tehran-backed Shi'ite militias such as Lebanon's Hezbollah. Mohammad Saeed Shahmiri, an executive with the Iranian company Saab Niroo which specialises in building infrastructure, said his firm was studying projects in and around Damascus but described the banking issue as the "most important problem". "We hope if they solve this problem, immediately we can start the project here," Shahmiri told Reuters at the forum. Keyvan Kashefi, chairman of an Iranian-Syrian chamber of commerce, said Iran and Syria had not had strong banking ties in the past few years. "This issue was constantly raised by the private sector of both countries," he said. "It was announced today that some agreements have been reached. And the banks of the two countries can now help businessmen and industrialists with financial exchanges and this problem of ours will be solved." Mohamad Hamsho, a businessman and chairman of the Syrian chambers of commerce, said agreements had been concluded to "overcome obstacles with respect to the banking activity between Iran and Syria". Helped by Russia and Iran, the government has crushed rebel enclaves across much of Syria, leaving a corner of the northwest in the hands of anti-Assad insurgents. Kurdish-led forces that are not hostile to Damascus control much of the east and north. Iran will build a 213 billion-Syrian pounds ($413.59 million), 526-MW power plant at Latakia, and a gas pipeline from Baniyas to fuel it, to be finished in three years, Syrian state media reported.